Post-materialism in the hothouse: Dog pen. he is not a very good example of making do. Has cost about 50 times more than the old recycled dog from the SPA, broken tail, bee eating incident, poison swallowing incident etc etc. ANYWAY, he is super on all other levels, and of course had to be mended properly, not with two sticks from the woodpile and a length of old string sadly. 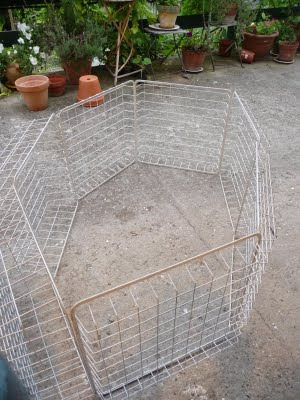 Needing an enclosure to keep him in, I hunted at usual haunts, no baby play pens available, but made one out of these white wire baskets. Don't know the original usage of them but for a euro...can't grumble. Bit of wire, and voila, excellent articulated dog pen now adorning our terrace.